Our NHS delivers excellent care and outcomes for acute/emergency care like heart attacks, car accidents, and broken limbs. Go see the doctor! However, the NHS is struggling to cope with the increasing demand for care for chronic conditions like, Headaches, Lower Back Pain, Stomach Pain, IBS, Type II Diabetes, Obesity, Stress, Anxiety, Autoimmune Conditions, Fibromyalgia, Chronic Fatigue and Thyroid Conditions. Our everyday hero GP’s and medical practitioners within the NHS struggle to people find answers to these complex problems due to limited time and resources. 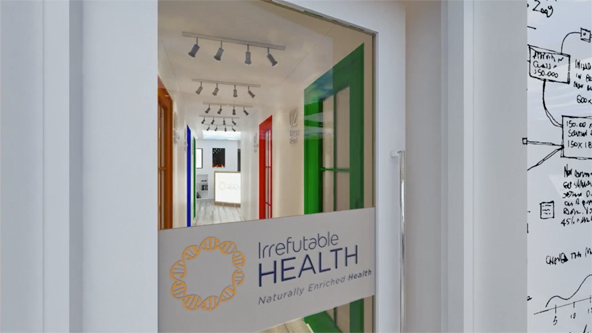 Irrefutable Health is a Centre of Excellence for Complementary Care, our specialists help their patients to identify and solve the underlying causes of persistent chronic problems, and then become as healthy as they can be! Blue zones are areas of the world where people tend to live measurably longer lives. How? They’re matching their individual genetic needs through their culture, lifestyle and diet. At Irrefutable Health, we’ll help our practice members through our Kingston location to identify their personal blue zone. In addition to the more customary assessment methods, (posture, neurology, biomechanics, biometrics, psychology, ergonomics), we can test your genetics and deliver your ‘blueprint,’ a personalised pathway to your health. Through an unparalleled approach to wellness, you can find answers, feel better and be coached to stay well. We have the resources to help you restore, support and maintain wellness. We are a dedicated and supportive team here for you. We help you make meaningful changes to impact your life and your health. We can help long distance members through virtual services. Call us to learn more. With a goal to offer the most comprehensive, life-changing care possible, we’re bringing together invaluable sister services all under one roof. Irrefutable Health: With chiropractors, acupuncturists, podiatrists, massage therapists and health practitioners that focus on functional medicine, our team is united through a passion to serve you. We’ll help you take an in-depth look into your health so that you can heal and live your most brilliant life. The Willow: an innovative health food restaurant and bar promoting the ‘Food as Medicine’ ethos, the Willow is the perfect venue to try foods that complement your genetic coding. As the first venue in Great Britain to serve gluten-free beer on tap, the Willow also offers a fine selection of biodynamic wines, homemade infused spirits and juices. Bluesky Connexions: This fascinating venture reviews research, provides educational lectures and lifestyle coaching on relevant in-depth health topics centered to assist you in finding your personal blue zone. Treat someone special to a voucher to use across the Tri-Health Group. Purchase a voucher which can be spent on food and drink in The Willow Restaurant and Bar, a treatment in the Irrefutable Health or a course of your choice from the Bluesky Connexions up and coming events. With years of experience and a wide variety of specialised training, we provide state-of-the-art care, follow and document your progress through ongoing evaluation, periodic calculations and easy to understand reports. We aim to adopt the Royal College of Chiropractic Quality Mark standard providing an extensive standard of care that’s built into your care and treatment at Irrefutable Health. Your data is held and when you visit your file via your practice member portal over time, we’ll provide you with the detailed look at your health progress. Learn more about our services and how we can help you take the opportunity to change your life. Give us a call today!